The four products were bleach (sodium hypochlorite), Sanidate 5.0 (with actives hydrogen peroxide and peroxyacetic acid), alcohol and “new product 2” (actives undisclosed as the product is not commercially available). Bleach achieved the 95% threshold at very low concentration (2%) and bleach is the lowest cost and easiest to find. 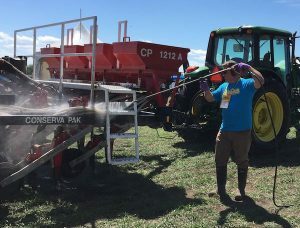 Disinfection demo at canolaPALOOZA in Lacombe, Alberta in 2018. “Bleach is currently the best performer. It is the most effective product at a reasonable concentration (2% sodium hypochlorite). The other products can get to 95% kill, but not until extreme concentrations of 60% to 90%. Bleach is already an inexpensive option, but at the lower rate, becomes much, much much more economical than using a concentrated alternative. Just like any tool, it also has its disadvantages. Bleach is corrosive to metals, causes rubber to harden, stains and damages clothing and footwear. But we have to take the bad with the good in this case, because there are essentially no other sensible alternatives. Ethanol is closely regulated in its distribution, so may not be easy to get. It’s expensive. And it’s flammable at the effective concentration. More on bleach: Target a 2% concentration of bleach to water. Use only sodium hypochlorite. Do not buy bleach unless the jug specifies sodium hypochlorite and includes the concentration. If a jug has 4.25% solution, for example, mix contents of the jug 50-50 with water to get to 2% bleach solution. At that solution and with a recommended contact time of 15 to 20 minutes, bleach will disintegrate clubroot spores leaving nothing viable behind. The other products tested: Some products were moderately effective, achieving 55-85% spore mortality — which isn’t good enough. Some products didn’t seem to work at all on clubroot. Virkon was among those that didn’t work in this study.